These nifty little pieces make connecting your gas and beverage tubing to your keg posts a breeze! Simply screw or unscrew your hose stem in order to switch tubing. No more cutting! Will fit 5/32" ID tubing. Best when coupled with a hose clamp. 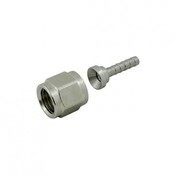 1/4" Chrome Plated Brass FFL Nut and 5/32" Stainless Steel Barb. Connects to 1/4" MFL threads. Will fit 5/32" tubing. Best if used with a flare washer and a hose clamp.